After the 9/11 attacks, the U.S. enjoyed quite some compassion and moral support from the international public. America had to react in some way. It decided that the terrorists were trained somewhere in Afghanistan and it has kickstarted the war against that šithole. That decision has made at least some sense. No one could return lives to the 3,000 victims of that bloody day – the day of my PhD defense in New Jersey – but at least, the victims' beloved ones could have felt that someone cares about the injustice that has happened to them. A few years later, Osama bin Laden was killed by the U.S. Navy SEALs, too. Now, more than 17 years later, NATO troops are still located in Afghanistan. The ongoing conflict over there has devoured more than one trillion dollars – the capitalization of the largest U.S. company (whether it's Microsoft or Apple right now). That amount probably exceeds the value of Afghanistan as a whole. The nominal GDP of Afghanistan is just $20 billion. If you treat it as a company, you would need to use P/E=50 to defend the valuation of Afghanistan near one trillion dollars. Maybe there are some great things on the territory of Afghanistan that are valuable although they don't contribute much to the GDP but I can't realize what those could be. Meanwhile, the people in Afghanistan are still savages, they still try to deal with drugs, many of them are still in Taliban and other groups. And politically correct people in the U.S. and elsewhere are supposed to be surprised. How is it possible that they are still bloody savages after 17 years of efforts? Well, they will be bloody savages even 170 years from now. None of these characteristics can change so quickly because their behavior is largely derived from their genes and 1300+ years of Islamic traditions. It's questionable whether the presence of the Western soldiers is even moving Afghanistan in the right direction. It's possible that it makes them even more hostile to the Western values. The conflict keeps on devouring lots of money – as well as human lives of NATO soldiers. I think that these lives may be blamed on the political correctness, namely on the ludicrous notion that all nations are almost the same and just some presence of friendly soldiers will turn the Afghani people to another copy of the folks in New Hampshire or Belgium. Surprise: It won't. Czechia has 250 soldiers in Afghanistan – some of them are special units. There were times when we were hearing that Czechs were among the most likable ones from the viewpoint of the Afghani folks. We were the fair ones. We were trusted. Well, something has changed about the relationship and I can assure my dear American readers that Czechs are almost indistinguishable from the American troops when it comes to their work and their prestige. In recent months, numerous Czech soldiers were killed over there. 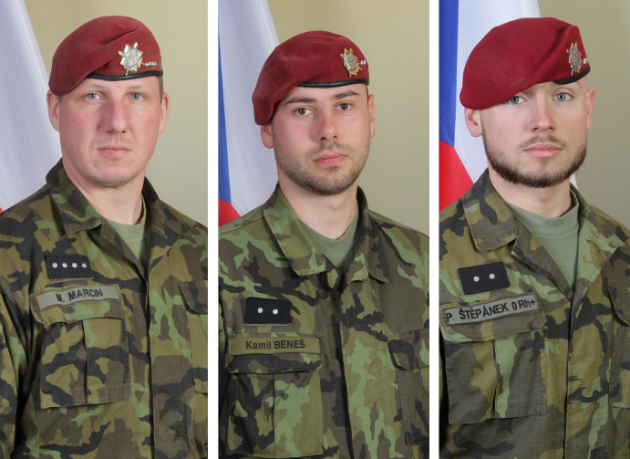 In August, an Afghani suicide bomber killed three Czech soldiers (picture above). One of them was born in the Pilsner region – and his funeral took place here in Pilsen. I am saying it to make you certain that the seemingly exotic conflict is already affecting our lives. They weren't the last Czech victims. On October 22nd, the 19-year-old Mr Wahidullah Khan killed Cpl. Tomáš Procházka (this is as typical a Czech name as you can get), a very likable guy who loved dogs and his two kids, and injured two other Czechs. sounds absolutely sensible. It reviews some of the facts I mentioned, some extra facts, and announces that both the U.S. Green Berets and Czech troops – who were clearly turned into real allies now when they're investigated together! – are being probed by the U.S. Army. It makes complete sense that some investigation is taking place because the Afghani chap died – and has been seen as a victim of some beating. And it seems absolutely correct to me that the newspaper has informed about that investigation. Even if there were no investigation, there should be one and the journalists could perhaps write about it in advance. It also seems clear to me that the Czech soldiers who knew both dead men – Mr Tomáš Procházka and Mr Khan – and perhaps some U.S. soldiers surrounding them are suspects. Mr Khan has turned out to be a real rat, a nasty insider killer. Many Czech soldiers – friends of the late Mr Procházka – were surely angered by the murder he committed. I would have a lot of understanding for their decision to beat the killer, especially because they could expect that he was awaiting a much milder punishment and a much better life than their murdered friend. It is not obvious whether Mr Khan was affiliated with Taliban, formally or informally, and whether he and/or his colleagues may confirm this affiliation, and so on. But I think that none of these things really matters much. He was an Afghani who shot dead a Czech soldier in something that is presented as an ongoing conflict between NATO along with the Afghani government against some other Afghani groups. So by his acts, Mr Khan has joined the likes of Taliban that are being fought against by NATO. It makes sense to treat him as an enemy and because he's been an "effective" enemy, he could very well be shot dead, too. It is still right to obey all the laws, to investigate, and punish those who have lynched Mr Khan. However, let me admit, I would pardon him or them if I were the Czech president. The hypothetical Czech culprit has only beaten a treacherous Afghani guy who turned out to be a killer of a friend. Is that so inadequate? I don't think so. But Czechia has seen quite some hysterical reaction to the article in The New York Times from people who can't possibly know what happened around Mr Khan. The prime minister Babiš (ANO) – who testified in the investigation of his apparent kidnapping of his son on Monday – was terribly insulted by the "absolutely scandalous" New York Times article. How dare they accuse the Czech soldiers that they tortured an Afghani guy? Similar hysterical reactions were heard from the defense minister Lubomír Metnar (ANO) as well as (Gen. Aleš Opata and) a top security expert of ODS that I vote for, Ms Černochová. She said that the New York Times were on par with Sputnik – and she didn't mean it as a compliment (while I probably find Sputnik less problematic than the New York Times; by the way, Sputnik later wrote a story, too). She's a very tough and articulate woman and security expert – she has beaten the former minister of interior Mr Chovanec in a shooting contest – but she mostly copies the attitudes of the U.S. pro-war machine, including the Russophobia and other things. I think that sophisticated U.S. readers would agree with me that she is a canonical establishment Republican – but one in skirts who speaks Czech. None of these people have any evidence that anything was inaccurate about the article in the New York Times – but they still attack the story hysterically. (Babiš is used to scream "I am innocent" independently of any investigation – even though he is rather clearly guilty of all the crimes he's investigated for.) The U.S. daily hasn't even claimed that Mr Khan was tortured by some Czechs. It just claimed that this possibility was being investigated by the U.S. Army. And I think that it is being investigated. So what the Czech prime minister and others are attacking isn't just The New York Times. They are also attacking the U.S. Army and its processes. I think it's insane. The murder of Mr Procházka is the main sad event here. Whether the – pretty much demonstrated – murderer was beaten is an irrelevant detail in comparison, and if he has died as a result of this beating, it's just a somewhat larger detail on top of it. Someone has probably beaten him and something tells me that the Afghani people were rather unlikely to have done so. These German policies look ugly but at some level, the harsh treatment of the killers of someone on "our side" – who was supposed to be peaceful – is a necessary part of any strategy that is meant to be a winning one. When even an Afghani murderer of a Czech soldier cannot be beaten by the dead guy's friends, and if such a possible beating is presented as a mortal sin, and the very suggestion that it could have taken place is sold as a terrible insult of the Czech army if not the Czech nation, it shows one thing: the Afghani enemies are treated not as less worthy humans but as superhumans. And one can simply never win the war with such an approach. The investigation should be completed. Some NATO troops will probably be found to be culprits. And they should be pardoned because the victim of the beating was just a treacherous killer of our guy – a killer who could have been instantly neutralized under different circumstances. And the journalists must be allowed to do their basic work – and what The New York Times has written down in this case seems to be nothing else than the facts. The Ukrainian-Russian relationships have become more tense again. The fifth columns of both Eastern Slavic nations are immediately certain who should be blamed. I am not certain at all. Especially when moving around Crimea, Russians and Ukrainians probably dislike each other a lot. They like to provoke. The result may be what both sides wanted for some reasons. Ordinary marines may react instinctively. Ukraine has sent a rather combative unnatural triplets of ships – perhaps with some agents. Presidents of both countries may want to be war presidents and improve their approval ratings. What I find important is that basically nothing has happened. If someone promotes this mostly innocent collision of some ships into a full-blown war, well, I will surely disagree with the statement that the collision was the true natural start of the war.